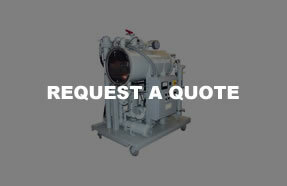 Vacudyne transformer oil purification systems are backed by over 45 years of experience. Units are available as portable, stationary, or mobile units, depending on required capacity. Vacudyne's new generation ethylene oxide sterilizer control system is designed with safety, efficiency and ease of use in mind. Available on new systems or as a retrofit to replace Antares control systems or other controls on existing sterilizers. Vacudyne oil purification systems are backed by over 45 years of experience. Vacudyne's Tobacco Conditioners provide uniform moisture distribution throughout bales or hogsheads of tobacco, which results in increased efficiency and reduces loss due to breakage. 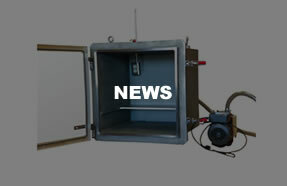 Vacudyne Inc. is a global provider of custom and standard EtO sterilizers, controls, service, and spare parts. 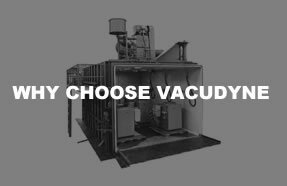 Vacudyne's line of Vacuum Pumping Skids are designed to meet a number of industrial vacuum applications including vacuum chamber evacuation, transformer dry out, and other industrial applications. Vacudyne was founded in 1957 to provide turnkey solutions for projects incorporating engineering design, fabrication, and system installation to enhance customer's production efficiencies. Vacudyne currently designs and manufactures vacuum process equipment and controls for medical device sterilization, oil purification, vacuum filling of transformers, and other vacuum related products. Vacudyne has manufactured oil purifiers and degasifiers for industrial and utility markets for nearly 40 years. These systems remove water, particulates and gases by vacuum dehydration. We also engineer and manufacture industrial vacuum process systems, sterlizers, and fumigators. The Sterilizers are utlized around the world servicing medical device manufacturers and contract sterilization facilities. Fumigators have been part of global partnerships with the agricultural industry, archival institutions and museums. Vacudyne’s new generation control is designed with user efficiency in mind. With an extremely user friendly Windows based graphical user interface, and intuitive drop down menus, Vacudyne’s new control system raises the bar for ease of use and efficiency. An SQL database provides a secure environment to protect your vital data while allowing access to historical information. A Windows based HMI displays current phase data in real time to keep you informed of cycle progress. End of cycle reports summarize the information. With a degreed engineering staff, latest AutoCAD, ASME certified and vertically integrated facility and over 50 years meeting the unique challenges of customer's needs, Vacudyne has engineered and manufactured a variety of products that have become "firsts" and set the standard for the industries served. Vacudyne continues to build on its foundation of solving challenges for its customers by providing high quality, innovative and environmentally responsible solutions for today and tomorrow. 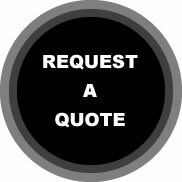 Let us help be a part of your solution. Vacudyne was founded in 1957 to provide turnkey solutions for projects incorporating engineering design, fabrication and system installation to enhance customer's production efficiencies, lower operating costs, and be environmentally responsive. New Facilities Monitoring System is designed to monitor and alert operations personnel of issues in production and process facilities; it has Allen-Bradley PLC and Wonderware HMI with Intuitive Graphic User Interface for Ease of Input Configuration.